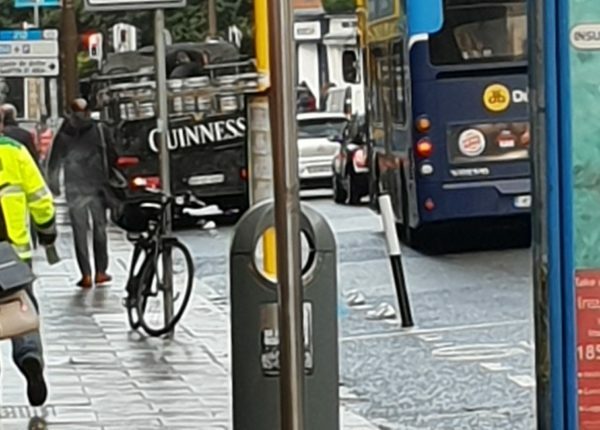 New safety kerbing installed on Leeson St in south Dublin in recent days is intended to keep vehicles out of the cycle lane along a pinch point stretch. But while we brought you news of the new orcas – lumps of reinforced plastic fixed into the road to create a barrier – yesterday, it seems not everyone was paying attention. Several drivers parked by the side of the road at this stretch today, including a Guinness truck and a group of motorcyclists. The truck driver not only ignored the new orcas in driving into the bike lane; he parked his truck there, blocking the bike lane and a section of the pavement. And the group of motorbikes parked inside the lane appear to be Defence Forces bikes. Like gardai, they can park in a manner illegal for civilians if they really need to while on duty. 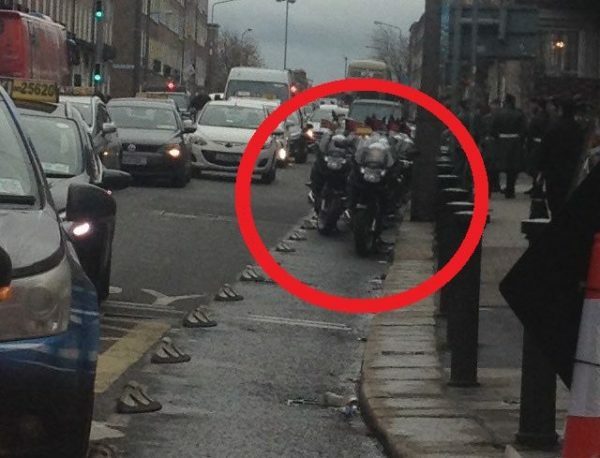 However, seeing several Defence Forces motorcycles parked in this way on such a new safety measure in Dublin looks awful, to say the least. 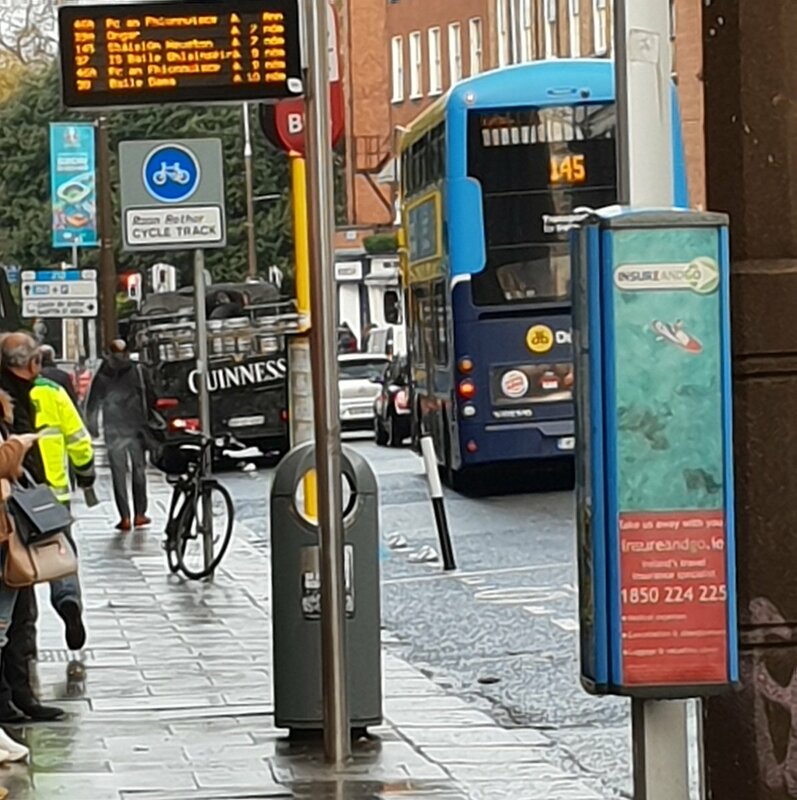 Clearly the effectiveness of these new orcas will depend on the willingness of the Garda to ensure any breaches of the bike lane are not tolerated. The orcas are fixed in the tarmac and create a barrier between the bike lane and the road space for vehicles; clearly marking out and segregating the cycle lane. As drivers and cyclists approach them, a flexi wand signals the start of the line of orcas. But in one of these photos that wand looks like it has already gotten a bang from a vehicle. The orcas are well spaced out, meaning cyclists can leave the cycle lane if they need to. And anyone in a wheelchair or with a child in a buggy won’t be impeded. These orcas – so called because they look a bit like orca whales – are an alternative to fully segregated cycle lanes. They are also much cheaper and faster to insert. But clearly we need a bit of enforcement from the Garda to ensure all road users grasp the concept of the new measure. Ideal world, nice and clear….